Will August burn red for Vodafone? Vodafone has officialli revealed its 4G plans and how its users can sign up to its new super-fast network. Head over to our all-you-need-to-know article for more details. Vodafone will confirm its launch plans for its 4G network later this week, as well as its intentions to go live in the same alongside O2 at the end of this month, The Times reported on Tuesday. The red network wasn't expected to launch its next-gen service until September, but could be planning to "beat O2 to the punch" by going live before August 29, when O2 has vowed to flick the 4G 'on' switch. The broadsheet said Vodafone is hoping to get a leg-up on O2 and claw back some of EE's early 4G LTE advantage by offering to buy out the contracts of some users whose phones won't work on the network. The report (subscription-only) claimed customers who bought phones like the iPhone 5, Samsung Galaxy S3 or Note II on Vodafone before June will be entitled to a new deal with a device that'll work on the 4G network. Just last week, O2's long-awaited 4G announcement was overshadowed by the realisation that Apple's iPhone 5 will be among devices incompatible with the network. The 4G radio within the iPhone 5 does not play nice with the 800MHz frequency snapped up by both Vodafone and O2 in this year's spectrum auction, or the 2.6GHz spectrum Vodafone also forked out for. This is expected to be remedied with future iterations of the iPhone, while Samsung Galaxy S4 owners will be able to upgrade their existing deals to include 4G service. 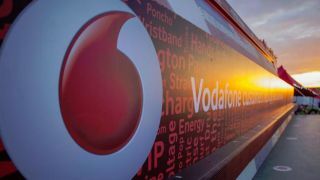 The Times' report claimed Vodafone's 'buy out' plans, which are yet to be confirmed, is an alternative to starting a price war between the UK's big three networks. Vodafone was a big winner in the spectrum auction, splashing out a whopping £790m on 85MHz of both the long-range 800MHz frequency and the more city-friendly 2.6GHz. Will it pay off when the network goes live? We'll let you know as soon as Vodafone confirms its plans. Did you hear the one about Vodafone, EE, a McLaren F1 car and a 4G fight?